Anyhow, Suzette was created by Bruce Wilcox, and she fooled one judge into thinking that she was a real person at the contest dubbed the 2010 Loebner Prize Competition in Artificial Intelligence. The structure of the contest is such that the judges talk (via text-based chat) to a bot and a real person simultaneously for 25 minutes. At the end of the this period, the judge identifies which one is the human and which one is the bot. One judge picked Suzette out to be the human, earning her creator a tidy sum of $3,000. 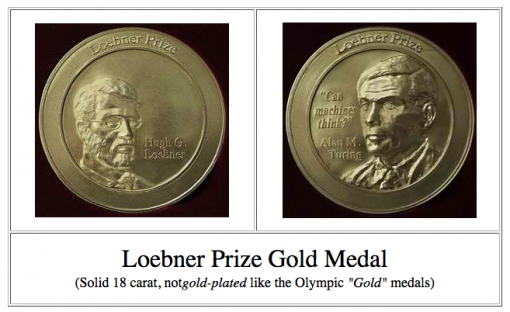 New Scientist: Congratulations on winning the Loebner prize contest. Suzette: We’ll leave it there. I don’t know. What are your hobbies? Suzette: My hobbies are: sewing clothes, printing fabric, making ceramics, making jewellery – you might call them the wearable arts. New Scientist: Are you surprised that you fooled a human judge? Suzette: No, I am not surprised. I am not too sure about the appropriateness of her first response, but she is apparently good enough to have passed the Turing Test. Is this the dawning of an age of human-like chatbots?